At Quay Dental, we only use dental products that are supported by extensive clinical studies and that we would be happy to have in our own mouths. 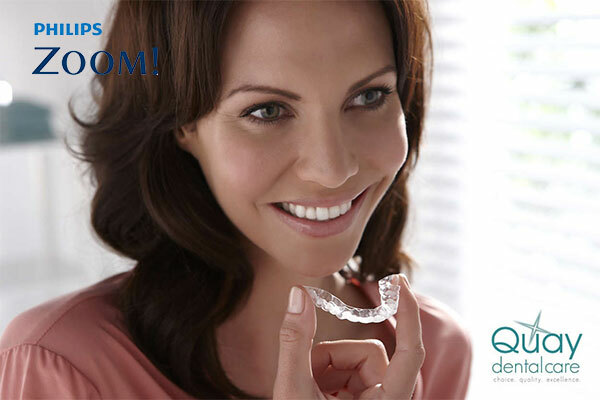 For this reason, we are proud to provide our patients with the tried and tested, best selling Take Home Teeth Whitening Kit from Philips Zoom®. Your first step when getting your teeth whitened is an initial consultation with your dentist – to ensure you are dentally fit for whitening treatment before we begin. If so, a dental impression is then taken and custom trays made from this impression and so that your new trays fit your teeth exactly. For optimum results, this will ensure that you get a very even and thorough coverage of gel on your teeth whilst wearing your trays. Finally, we will show you how to use your new whitening trays and gels at home as well as provide you with ‘instructions for use and aftercare’ to take away. As a guideline, we advise that it usually takes up to 7 to 10 days to see any noticeable effects of treatment and the level of whiteness you achieve will depend on your diet and the porosity of your teeth. Looking for a Teeth Whitening dentist?